2000 Amada VIPROS-568 50 Ton 62-Station CNC Turret Punch Press s/n 56810038 w/ Amadan 04P-C CNC Controls, DNC Control Module, 62-Station Thick Turret, 2-Indexable Stations, Pneumatic Die Extractor, Automatic Sheet Repositioner, 60” x 162” Ball-Top Table, External Hydraulic Power Unit, Koolant Koolers Cooling Unit. 1991 Amada PEGA-357 mdl. PEGA-30-50-72 30 Ton 58-Station CNC Turret Punch Press s/n AA570410 w/ Amadan 04P-C CNC Controls, 58-Station Thick Turret, 2-Indexable Stations, Pneumatic Die Extractor, Automatic Sheet Repositioner, 50” x 142” Ball-Top Table. 1991 Amada PEGA-357 mdl. PEGA-30-50-72 30 Ton 58-Station CNC Turret Punch Press s/n 03572133 w/ Amadan 04P-C CNC Controls, 58-Station Thick Turret, 2-Indexable Stations, Pneumatic Die Extractor, Manual Sheet Repositioner, 50” x 142” Ball-Top Table. 1989 Amada PEGA-357 mdl. PEGA-30-50-72 30 Ton 58-Station CNC Turret Punch Press s/n AA570237 w/ Amada-Fanuc-P CNC Controls, 58-Station Thick Turret, 2-Indexable Stations, Pneumatic Die Extractor, Automatic Sheet Repositioner, 50” x 142” Ball-Top Table. 1993 Amada FBD-1030 100 Ton x 10’ CNC Press Brake s/n 1030388 w/ Amada NC9-EX II Controls, 118.1” Table Length, 122” Max Bend Length, 106.3” Between Uprights, 15.76” Throat Depth, 3.94” Stroke, 14.58” Open Height. 1988 Amada RG-100 100 Ton x 10’ CNC Press Brake s/n 102231 w/ Amada NC9 Controls, 118.2” Table Length, 122.1” Max Bend Length, 100.5” Between Uprights, 15.76” Throat Depth, 3.94” Stroke, 14.58” Open Height. 1984 Amada RG-100S 100 Ton x 100” CNC Press Brake s/n 102638 w/ Amada NC9 Controls, 98.5” Table Length, 102.4” Max Bend Length, 80.8” Between Uprights, 15.76” Throat Depth, 3.94” Stroke, 14.58” Open Height. 1982 Amada RG-80S 80 Ton x 78” CNC Press Brake s/n 804985 w/ Amada NC9 Controls, 78.8” Table Length, 82.1” Max Bend Length, 59.9” Between Uprights, 15.76” Throat Depth, 3.94” Stroke, 13.97” Open Height. 1999 Amada RG-5020LD 50 Ton x 78” CNC Press Brake s/n 50200020 w/Amada LD Controls, 78.8” Table Length, 82.1” Max Bend Length, 59.9” Between Uprights, 15.76” Throat Depth, 3.94” Stroke, 14.58” Open Height. 1996 Amada RG-50 50 Ton x 78” CNC Press Brake s/n 509102 w/ Amada NC9-EX II Controls, 78.8” Table Length, 82.1” Max Bend Length, 59.9” Between Uprights, 15.76” Throat Depth, 3.94” Stroke, 14.58” Open Height. 1986 Amada RG-50 50 Ton x 78” CNC Press Brake s/n 505804 w/ Amada NC9-EX Controls, 78.8” Table Length, 82.1” Max Bend Length, 59.9” Between Uprights, 15.76” Throat Depth, 3.94” Stroke, 14.58” Open Height. 1982 Amada RG-50 50 Ton x 78” CNC Press Brake s/n 504228 w/ Amada NC9 Controls, 78.8” Table Length, 82.1” Max Bend Length, 59.9” Between Uprights, 15.76” Throat Depth, 3.94” Stroke, 13.79” Open Height. 1984 Amada / Promecam RG-50 50 Ton x 78” CNC Press Brake s/n 50505039 w/ Amada NC9-EX Controls, 78.8” Table Length, 82.1” Max Bend Length, 59.9” Between Uprights, 15.76” Throat Depth, 3.94” Stroke, 14.58” Open Height. 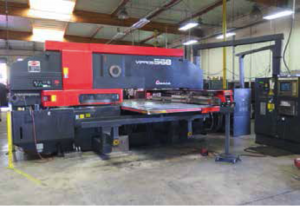 1984 Amada / Promecam RG-50 50 Ton x 78” CNC Press Brake s/n 50504812 w/ Amada NC9-EX Controls, 78.8” Table Length, 82.1” Max Bend Length, 59.9” Between Uprights, 15.76” Throat Depth, 3.94” Stroke, 14.58” Open Height. 1993 Mazak Super Turbo X48 HI-PRO CNC Laser Contour Cutting Machine s/n 100757 w/ Mazatrol L32 CNC Controls, Panasonic YB-2006LB5M2 2000 Watt CO2 Laser Source, 4’ x 8’ Table Cap, Slug Conveyor. 1998 Fadal VMC3016HT mdl. 904-1 CNC Vertical Machining Center s/n 9805022 w/ Fadal CNC88HS Controls, 21-Station ATC, CAT-40 Taper Spindle, 7500 RPM, High Speed CPU, Graphics, 5C Indexer Interface, 16” x 36” Table, Coolant. 2000 Haeger 618-1L 6 Ton x 18” Hardware Insertion Press s/n 06L-00816. Haeger HP6-B 6 Ton x 18” Hardware Insertion Press s/n 302. Haeger HP6-B 6 Ton x 18” Hardware Insertion Press s/n 193. Haeger HP6-B 6 Ton 18” Hardware Insertion Press s/n 694 (NEEDS WORK). National Rivet Co. mdl. 500B Automatic Rivet Inserter s/n 2173 w/ Auto Feeder, Touch-O-Matic Safety Device. Amada M-2045 3/16” x 78” Power Shear s/n 2401209 w/ Amada Controlled Back Gage, 84” Squaring Arm, Front Material Supports. Pexto mdl. 390-E 36” Power Roll w/ 2 ½” Rolls, Stand. Timesavers mdl. 137-2HP75 2-Head 36” Belt Grainer s/n 22152M w/ Belt Feed. Timesavers mdl. 337M-1 36” Belt Grainer s/n 8696 w/ Belt Feed. Wheel, 6 ½” 3-Jaw Chuck, Coolant. Amada TEG Punch Die Grinder w/ 7” Grinding Wheel, 6 ½” 3-Jaw Chuck. Amada and Wilson Punch Die Tooling. Cabinets w/ Punch Die Tooling. Amada Tapping Heads and Letter Stamping Heads. Tapmatic and Procunier Tapping Heads. Power Tools, Pneumatic Tools and Hand Tools. 36” x 48” x 6” Granite Surface Plate w/Stand. Acra AM-4V Vertical Mill s/n 980381 w/ 3Hp Motor, 60-4200 Dial Change RPM, Power Drawbar, Chrome Box Ways, 10” x 54” Table. Bridgeport Series-2 Vertical Mill w/ 1Hp Motor, 80-2720 RPM, 10” x 48” Table. Darsin 12” x 36” Gap Bed Lathe (NEEDS WORK). Delta 4-Head Gang Drill Press. Doringer mdl. D-350 14” Miter Cold Saw w/ 2-Speeds, Speed Clamping, Coolant. Jet 14” Vertical Band Saw. (2) Abrasive Finishing “Super Quiet Bur-Bench” Media Tumblers. Ingersoll Rand “U” Series 30Hp Rotary Air Compressor s/n K6351U88E w/ 120 Gallon Tank. Mattei 50Hp Rotary Screw Air Compressor. 36” x 74” x 40” Large Capacity Dry Blast Cabinet w/ Dust Collector. 6” Belt / 8” Disc Sander. Lohr-Herrmann Dust Collector w/ Barrel Style Discharge. Miller Syncrowave 500 CC-AC/DC Arc Welding Power Source s/n KG031854 w/ Best-Welds Cooler. Miller Syncrowave 350LX Arc Welding Power Source s/n LE299212 w/ Miller Coolmate-3 Cooler. Miller Syncrowave 250DX Arc Welding Power Source s/n MB390009L w/ Miller Cooler Cart. Miller Syncrowave 250 CC-AC/DC Arc Welding Power Source s/n KJ244921 w/ Miller Cooler Cart. Miller Syncrowave 250 CC-AC/DC Arc Welding Power Source s/n KJ191925 w/ Miller Cooler Cart. Miller Syncrowave 250 CC-AC/DC Arc Welding Power Source s/n KH558524 w/ Cooler. Miller Syncrowave 250 CC-AC/DC Arc Welding Power Source s/n KE631328 w/ Weld-Tec Cooler. Miller Millermatic 250 CV-DC Arc Welding Power Source and Wire Feeder s/n KF876025. Miller Syncrowave 200 CC-AC/DC Arc Welding Power Source s/n LH330558L w/ Miller Coolmate-3 Cooler. Miller Syncrowave 200CC-AC/DC Arc Welding Power Source s/n LF460138L. Lincoln Idealarc SP-200 CV-DC Arc Welding Power Source and Wire Feeder s/n AC-640115. 2000 Amada ID-40-ST 80kVA Spot Welder s/n 40800173 w/ Amada DIT-543AE-2 Inverter Resistance Welding Controller, Hand Control Module, Amada CU 4002 Cooling Unit. Janda R3-250-36R 250kVA x 36” Spot Welder s/n R-2139 w/ Janda-600V Digital Welding Controller. Acme Type 3-24-40 40kVA x 24” Spot Welder s/n 11384 w/ iii mdl. 105 Single Pulse Microprocessor Controls. Hypertherm PowerMAX 380 Plasma Cutting Power Source s/n 380-026805. 6’ x 27’, 6’ x 24’, 6’ x 12’, 6’ x 10’ Steel Welding Tables. Welding Clamps, Bar Clamps and C-Clamps.